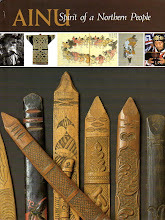 As I have mentioned in previous posts about Ainu design, wood carving was, and still is, "men's work." Both of the storybooks I've translated, and many more of the yukar, have scenes involving the menfolk carving wood-- sometimes tools and arrows, but often items of spiritual significance such as the inaw (sacred shaved sticks) and ikupasuy (prayer sticks). The photo posted here was borrowed with permission from a site called Old Photos of Japan, which displays photos of Japan between the 1860s and the 1930s, and includes some rare scenes from Ainu life. This particular photo shows an Ainu man carving what appears to be a prayer stick. Click here to read the informative article that goes with the photo. More about the purposes and designs of wood carving in my next post. The Owl and the Message is my English version of the Song Sung by the Owl God~ Konkuwa from Chiri Yukie's yukar anthology. 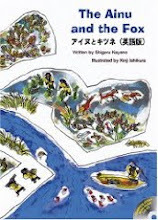 I translated and retold it in view of getting it published as a storybook for English-speaking children. The message to which my title refers, is a timely one for our day. 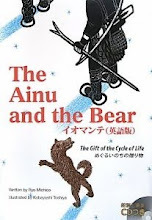 In the story, the Ainu villagers are starving because the mountains and rivers no longer provide the food they need. 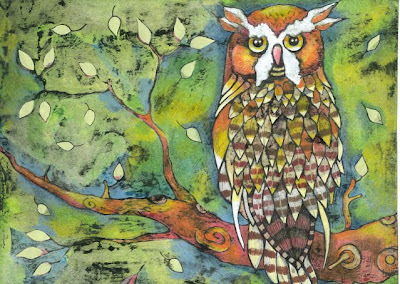 The owl kamuy, who is the guardian of the village, sends a message to the land of the kamuy gods to find out why this situation has come about. He receives a reply with an explanation, a warning, and a chance for the village to redeem itself. I find it easy to imagine this yukar being chanted to generation after generation of young Ainu, as a lesson in both personal and group responsibility, the consequences of one's behavior, and how to co-exist with nature. A young crow came to my door and said, “No one is better at speaking than I am. You can count on me to deliver your message.” So I began to tell him the message as I beat on the lid of the wine cask, for my message was a long one. Three days passed and I was still only part way through the message. But I looked up and saw that the young crow had fallen asleep next to the hearth. I became very angry and beat the crow to death. Once again I called out, “Is there anyone who is good at speaking and can be trusted to deliver my message?” A mountain jay came to my door and said, “No one is better at speaking than I am. You can count on me to deliver your message.” So I began to tell him the message as I beat on the lid of the wine cask, for my message was a long one. Four days passed and I was still only part way through the message. But I looked up and saw that the mountain jay had fallen asleep next to the hearth. I became very very angry and beat the mountain jay to death. Once again I called out, “Is there anyone who is good at speaking and can be trusted to deliver my message?” A young water ouzel came to my door and respectfully entered my house. I saw that he was well-dressed and had good manners. So I began to tell him the message as I beat on the lid of the wine cask, for my message was a long one. After six days and nights I looked up and saw that the water ouzel was wide awake and still listening carefully to my words. As soon as I finished speaking, the water ouzel flew out of the house through the smoke hole in the roof and took my message up to heaven. That night I went to the humans in their dreams and explained to them the reason for the famine. I then taught them how to treat the deer and fish with honor. The humans changed their ways from the very next day. They began to treat wildlife with respect. They used beautifully carved sticks for fishing and hunting, and they adorned the deer and fish after catching them, so that their spirits could return to heaven in honor. The gods now provide the humans with enough to eat, and there is no fear that they will starve any more. The crisis is over and my spirit is free to leave this old body at last. I will now go to heaven, leaving the human world in the care of younger owl guardians. I'm not sure whether I should stick to the relatively formal language of the original yukar, or if I should revise it to sound more modern and informal. I also wonder how Western readers will react to what happens to the crow and the mountain jay. Will I have to soften the language? Or should I be true to the original? If you have any thoughts on these issues, I welcome comments. The attached illustration is the work of Stephanie Gagnepain. Traditional Ainu dance is ...closely connected to the lifestyle and religion of the Ainu. The traditional style involves a large circle of dancers, sometimes with onlookers who sing an accompaniment without musical instrumentation. Some dances imitate the calls and movements of animals or insects; others, like the sword and bow dances, are rituals; and still others are improvisational or purely entertainment. Believing that deities can be found in their surroundings, the Ainu frequently use dance to worship and give thanks for nature. Dance also plays a central role in formal ceremonies such as Iyomante, in which participants send the deity embodied in a bear they have eaten back to heaven by mimicking the movements of a living bear. For the Ainu, dance reinforces their connection to the natural and religious world and provides a link to other Arctic cultures in Russia and North America. For the rest of the article click here: UNESCO site. It also has slides and a video showing traditional Ainu dance. The video I've posted below is from YouTube. It's one of my absolutely favorite videos, and shows both the stunning dance of real red-crested cranes and the Ainu dance that derives from it. Enjoy! This article was in the October 4 edition of the Mainichi Daily News. SAPPORO -- A children's performance group here will stage musical performances featuring Ainu culture next week. The Sapporo Kodomo Musical Ikuseikai, a group from Hokkaido Prefecture, will perform two original musicals at the New National Theater in Tokyo's Shibuya Ward on Oct. 6 and 7. Through the musical pieces featuring Ainu, an ethnic group indigenous to Japan's Hokkaido area, some 40 children aged 5 and 15 will depict the splendor of Ainu culture and the message of coexistence. The theater group was established by director Mariko Hosokawa, 78, in 1981. Born in Nagasaki, Hosokawa moved to Sapporo in 1958 when she married her husband. 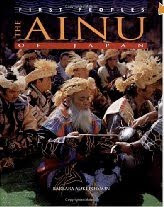 She then came across Ainu culture, and became captivated by the lifestyle of the aboriginal Ainu people. At the same time, however, Hosokawa came to learn about the deep-rooted discrimination and prejudice against Ainu people. 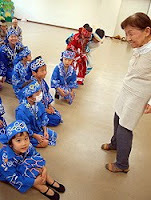 Hosokawa says that she founded her musical troupe because she wanted to introduce her Ainu knowledge to children, who are far more open-minded than adults. In 1979, the group performed its first Ainu musical with the participation of about 100 children in Sapporo. Hosokawa received a vast number of threatening calls. "I thought someone might come to kill me," said Hosokawa. "It was a spirit of rebellion that pushed me. I wanted to denounce the discrimination through the musical." During the Tokyo performance, the children will perform "Pororintan," a musical production based on the life of Hosokawa's late Ainu teacher Shigeru Kayano, the first Ainu to become a member of the Japanese Diet, and "Hitotsu no owande tu miku miku," an Ainu saga called "Yukar." None of the 40 children performing the musical has Ainu background; however, they hope to promote understanding of the ethnic culture among people. 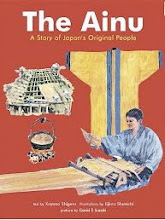 "Ainu people respect all living creatures including animals and plants. I want people in Tokyo to realize how great that is," a 10-year-old boy from the troupe said. Last year, the Japanese Diet officially recognized Ainu as Japan's indigenous people. The government is now moving forward to establish new laws to protect Ainu from discrimination and poverty. It has been 30 years since Hosokawa started her activities in the hope of eradicating prejudice against Ainu people. "We've finally come this far," Hosokawa said.